The Traits of An Innovator: Ali Al-Halabi’s Cutting off Speech, Playing About with it and Distorting it’s Meanings. Abu Usaamah himself said about Ali Al-Halabi – “ I am a supporter of Ali Hasan Al-Halabi. I support him. I support what he is upon.”1. Ali Al-Halabi is known for his cutting off speech, adding to it and distorting it, in order to support his corrupt principles. An example of this which follows is his cutting from the speech of Imaam Abdur-Rahmaan As-Sa’di (rahimahullah). Here let us first present to the reader the original text from the Imaam himself, before any distortions were added by Al-Halabi. Once the reader acquaints himself with such trickery then this is in reality enough (a reason) to bring Al-Halabi down and warn against him! من الغلط الفاحش الخطر قبول قول الناس بعضهم ببعض، ثم يبنى عليه السامع حبا أو بغضا، ومدحا وذما؛ فكم حصل بهذا الغلط من أمور صار عاقبتها الندامة، وكم أشاع الناس عن الناس أمورا لا حقيقة لها بالكلية، أو لها بعض الحقيقة فنميت بالكذب والزور، وخصوصا ممن عرفوا بعدم المبالاة بالنقل، أو عرف منهم الهوى. فالواجب على العاقل التثبت والتحرز، وعدم التسرع. So based on the above version (transmitted by Al-Halabi Al-Mubtadi), it means that the Imaam said “from the repugnant dangerous mistakes is when people accept one another’s speech, then the one who hears that speech establishes love, hate, praise and dispraise based on that”; then he [Halabi] went on to complete it with “how many mistakes have been committed (through this behaviour) regarding affairs whose end result became a matter of regret?! And how many affairs have been spread by people from other people which are a complete unreality?! Therefore, it is obligated on an aaqil (i.e. a sensible person of intellect) that he ascertains, takes precaution and not to be hasty. And by way of this, the religion of a person is known (i.e. soundness of his path), his composure and aql (sound reasoning or intellect). So why is it omitted? Because if he were to include the full statement, it would no longer give credence to his own innovated principle of “having to verify from everyone – thiq’a (trustworthy) or ghayr thiq’a (non trustworthy)”. Furthermore he makes manifest his own innovated principle, as part of his notes, in order to pollute the reader’s thinking into holding that you “must check and verify the statements of a thiqa’ person”, in the same way you must verify one who isn’t thiqa’. This is in contradiction to even how Imaam as-Sa’di(rahimahullah) presented it, as he was making clear to the reader to beware those who are untrustworthy- not trustworthy. “This is also from the etiquettes expected from those of understanding to adorn themselves with and implement. And that when a faasiq informs them of some news, they [should] verify the news he transmits (to them) and don’t just simply accept it; for indeed there is a grave danger in that and [risk] of falling into sin. Because if his news is made the same as that of a truthful upright person, the decision is made in accordance with that and what it necessitates. Then lost of lives and wealth occurs without due right due to that information, resulting in regret. Rather what it is obligatory is that when a faasiq transmits news, it is verified and clarified. If the proofs and supporting factors affirm his truthfulness, it is acted upon and believed. And if they indicate to falsehood, it is declared false and not acted upon. I am a supporter of Ali Hasan Al-Halabi. I support him. I support what he is upon. His mistakes we put that aside. I say that in public and I say that in private. 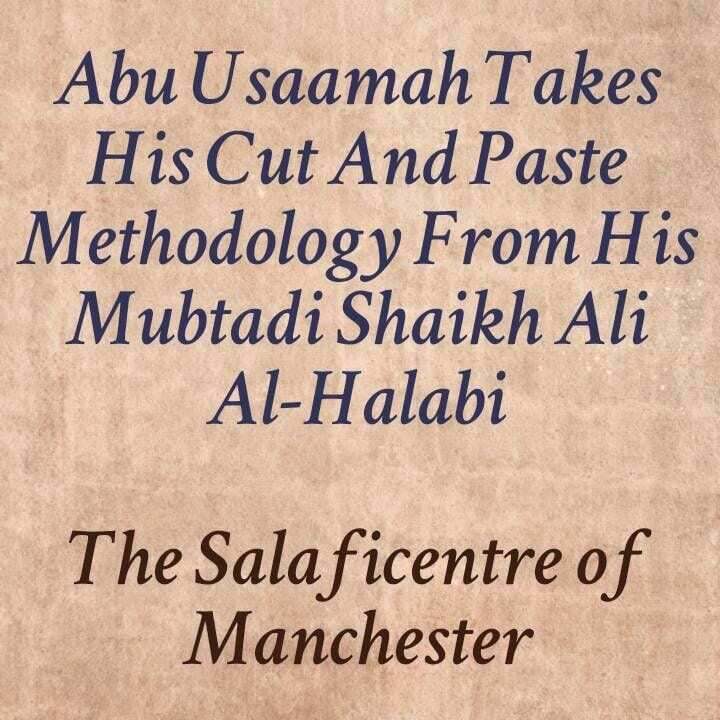 And so we can see that the bid’ee Abu Usaamah is just a mirror of his innovator Shaykh Ali Hassan Al-Halabi. There is no difference in their methodology! This is affirmed by Abu Usaamah ad-Dhahabi’s own statements as quoted before; as well as his actions, wherein both have been caught twisting speech of the Scholars of truth and Sunnah, in order to suit their agenda and ideology that they want to promote. It is important that the noble reader is made aware of such sneaky trickery, lest they be taken in by their speech, and be taken astray, and with Allah is the success.